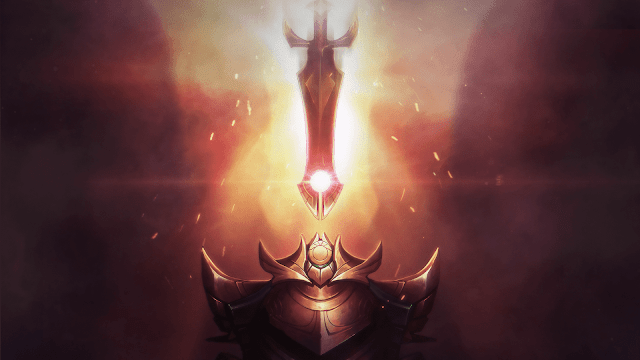 Red Post Collection: Quick Gameplay Thoughts: 10/31, VFX & SFX Updates in 8.24, /Dev on Ranked in 2019, & more! Thread: Red Post Collection: Quick Gameplay Thoughts: 10/31, VFX & SFX Updates in 8.24, /Dev on Ranked in 2019, & more! Today's red post collection includes Meddler's quick gameplay thoughts for October 31st, details on VFX and SFX updates for some older champions in 8.24, /Dev blogs on Ranked in 2019, Clash updates, & more! Preseason's getting pretty close now. We've talked about the larger changes a fair bit, most recent update at the link below in case you missed. Wanted to run through some details on a few additional changes as well. Changes to the jungle earlier in the year, including the removal of the overlevelled xp penalty, mean junglers are often getting quite a bit more XP than they were previously, which can include them being highest or highest equal level on their team a bit more than we believe is appropriate. We're cutting the amount jungle XP scales over time back slightly as a result. Change we're testing involves camps giving the same amount of XP at game start, but scaling 5% slower over time. We're bumping up the value of taking a bit, since at present it's not proving to be as much of a priority as intended early game. Current tactics in testing for that are having the first stack of each buff give more benefit than the following ones (e.g. Cloud at 3%, 4.5%, 6% versus 2%, 4%, 6%) and increasing gold/XP a bit, so trade off versus taking regular camps isn't unnecessarily punishing. We're testing some modifications to Spear of Shojin with an eye to bringing it out in preseason. For anyone unfamiliar it's an item we had on the PBE around midseason that gave AD, health and defense based on your AD. Versions we're currently look at involve changing from flat DR to % DR (less abusive in certain cases, much clearer interactions with pen) and build path changes. Not currently planning to release Atma's Reckoning, which was the other item PBE'd during midseason, possible we end up merging some elements of it (some of its build path perhaps?) with the changes to Spear though. We're planning on decreasing the number of Control Wards that can be carried at once to 2, from its current 3. That's targeted at play where they're being used almost like consumable red trinket charges despite the cost, providing unintended amounts of vision denial. We're not trying to remove that entirely, but do want to increase opportunity cost of doing so somewhat, hence the lowered cap. We're testing a reduction in Fleet Footwork's AP ratio at present. That's not driven by a desire to push AP users off Fleet Footwork, but instead due to the decoupling of stats from choice of rune tree. We've kept Fleet Footwork's AP ratio high until now because the cost of going into Precision for many AP champs was quite high, given they usually don't get as much benefit from Attack Speed. Now you'll be able to choose your stats on the other hand the tree's quite a bit more accessible to them, so pushing AP ratio so far above where it would normally be isn't needed as much. Maokai - Considering a few different buffs aimed primarily at buffing his jungling, given he's performing quite a bit weaker there than in lane. Nunu - Has never quite performed as well as we expected him to post update, even with optimal builds. Looks like we were a bit off in terms of how much power he'd get from learning curve. Giving him a bit more mid combat durability in particular as a result, with a stronger heal when he uses his Q on champions. Taliyah - Testing a change where Q deals reduced damage to monsters, but has a lower CD and mana cost. Somewhat experimental, so might not ship. Taliyah jungle is performing too well in high tier play, both solo queue and pro. Mid lane performance by contrast isn't out of line, so looking at solutions that target jungle primarily. Trundle - We hit him too hard with previous nerfs. Putting some damage back in, both base and ratio as a result. Viktor - After some more investigation we're probably going to take a bit of power out of tank Viktor builds while aiming to keep AP Viktor around his current power level. Still down to see some top lane Viktor, starting to see it perform really well when tanky even though a lot of players doing it aren't that experienced yet. Trying to tone it down a bit as a result without going so far as to remove it from being a good choice at least some of the time. I'll be out of town for a couple of days, so no second post this week. Back to normal next week." Similar to the recent Jarvan, Lee Sin, Veigar, and Vi updates, we're working on VFX and SFX updates to more champions whose spell effects are in need of some love to get to current League standards and improve gameplay clarity. In Patch 8.24, we'll be releasing VFX and SFX updates for Anivia, Dr. Mundo and Renekton, and VFX-only updates for Gragas (he already received some SFX love) and Teemo. Keep an eye on this post and we'll add visual previews as they become ready! Please try them out on the PBE—especially if you're a main—when they're in and leave us your feedback here! BA - New trails and impacts for more satisfaction. Q - Now clearer, with a subtle trail to make it more easily readable. Cleaver also now stays stuck in the target for a short time, for maximum satisfaction! W - Now properly shows the range of the AOE, while feeling more threatening. Targets are also briefly visually put on fire when damaged. E - New buff effect on his wrists makes it easier to identify when it's active. R - Bigger initial burst and overall clearer effect makes it actually look like a heal, and is now much easier to see in a Teamfight. Or a tower-dive. SFX update across the board to clean up unnecessary noise and added higher definition sounds. BA - Clearer SFX on the hit of the attack. Q - Clearer SFX on when the cleaver is thrown and hits. W - Activation audio is clearer. E - Added Zaun elements into the audio. R - Added Zaun elements into the audio. All Mundo skins that previously used base VFXs have been updated to use the new ones, with subtle changes where it makes sense. We'll be showing previews of the other champions in the near future, so keep your eyes peeled!" "Hey, Renekton's VFX artist here. Renekton's VFX will be updated across all of his skins, as all of them had very old, unclear VFX. Galactic Renekton will use base's VFX, but with a recolored Ult. 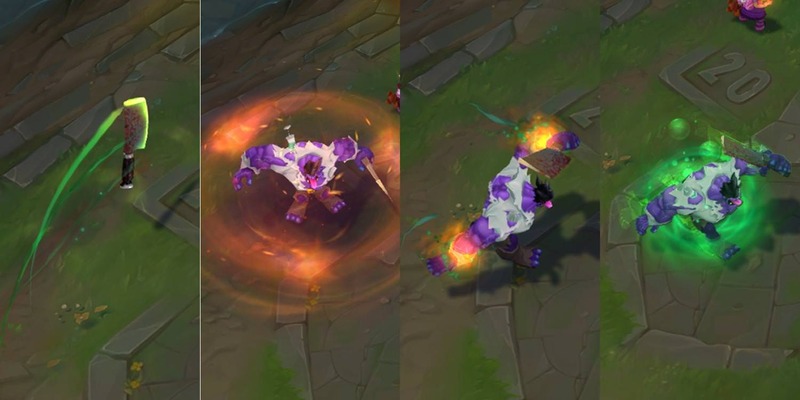 SKT Renekton also has recoloured base VFX, with a unique Ult decal featuring SKT's logo. Pool Party Renekton's ult will be changed the least, it's just slightly adjusted to shift the focus to the edge of the AoE so you can clearly tell when an enemy is in range. Renektoy is a weird case: As a 750 RP skin, it shouldn't have any unique VFX, but when he was made he was given Pool Party Renekton's ult, but with nuts and bolts (?). I inquired with the team who originally worked on him, and they said he was given Pool Party's ult because Base ult was so noisy, but the nuts and bolts were removed after it went to PBE, because the team felt they didn't really make sense as he's a toy and not a robot. Because I've now fixed the noisiness of base, I'm reverting him to using base VFX. Once I post my preview, please let me know how it feels. If it's feels bad, I will take a look and see what we can do for Renektoy's Ult. We're trying to respect skin pricing tiers, but since this is already a weird case, I might be able to do something unique for this skin." "Hey everyone! Ed “SapMagic” Altorfer here, back again to talk about Ranked. In our latest video we detailed how splits work and how you’ll earn split-based rewards. We also answered a bunch of common questions you’ve been asking. In this article, we’re going to cover a few topics we weren’t able to get to in the video: season rewards, how Honor ties into Ranked, and what we’re doing to recognize players who go above and beyond to demonstrate their skill.